This post is the third in a series analyzing potential shifts in policy at the Consumer Financial Protection Bureau (CFPB) in the months ahead. Read the second piece on the CFPB’s retreat from mortgage data collection here, and the introduction to the series here. It may not be immediately apparent, but the Acting Director of the Consumer Financial Protection Bureau Mick Mulvaney’s decision to re-brand the Office of Fair Lending and Equal Opportunity (OFLEO) will significantly reduce the Bureau’s ability to police discriminatory lending. Converting the Office of Fair Lending to one of internal policy advocacy will in effect dismantle it, creating a significant step backward for those whose goal is eliminating racial discrimination in lending. Mulvaney’s decision to dismantle OFLEO raises serious legal questions given that CFPB was required by Congress to establish specific functional units, one of which was the Office of Fair Lending and Equal Opportunity. Perhaps Congress correctly anticipated potential ideological reversals, like Mulvaney’s, when it moved to explicitly mandate that the director establish a separate office to supervise and enforce fair lending laws. In 2009, the Government Accountability Office reported that “[f]ederal oversight of lenders that may represent heightened risks of fair lending law violation [was] limited,” and recommended that “Congress . . . consider how to best ensure consistent and effective federal oversight of the fair lending laws.” The legality of Mulvaney’s change is unclear, as is the question of who would have legal standing to challenge the acting director’s change in court. Holding aside whether Mulvaney can thwart the will of Congress as reflected by Dodd-Frank, there is an important and immediate concern: What practical impact will this change have on enforcing fair lending laws? The answer, unfortunately, is a lot. Start with priorities. Enforcing fair lending is a policy decision dependent on the director’s political commitment. 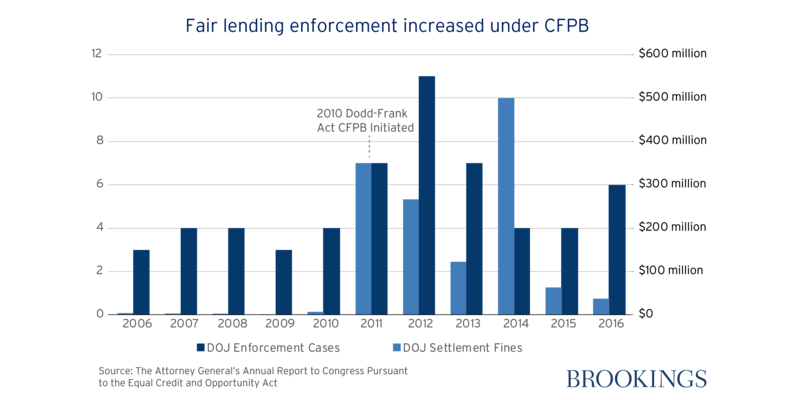 As the chart below shows, prior to the establishment of CFPB in 2010, the Department of Justice (DOJ) demonstrated a weak appetite for enforcing fair lending laws. The data demonstrate that under CFPB Director Cordray, fair lending enforcement was a priority with a sharp increase in cases brought, and an even larger increase in fines and settlements. Of course, there are other changes involved, including broader changes in the overall administration’s goals, and the subprime mortgage meltdown and subsequent economic recession. The decline in fines could be interpreted as the market normalizing CFPB’s fairness and transparency expectations. But enforcement actions are one of the two regulatory policy tools available to the CFPB. The other arguably more influential, but less public, tool is supervisory oversight. Regulatory oversight is not very different from parenting. Sometimes, demonstrative disciplinary actions are warranted, but more often, guidance and monitoring are employed, which effectively helps to course correct errant behaviors. Fair lending supervision is a confidential relationship between the guiding regulator and the supervised institution, and it was effective in the years following the creation of the CFPB. How do we know? Consider that the ratio of CFPB enforcement actions to supervisory examinations is small. In 2014, CFPB reportedly conducted 150 supervisory exams, but only took up 45 enforcement cases (this includes joint DOJ and CFPB-only enforcement actions). The difference is a strong indication that resource-intensive enforcement was not the Bureau’s front-line tool, but one reserved for instances of egregious violations warranting substantial corrective action. OFLEO used supervision to course-correct problematic lending practices and reshape governance policies before they inflicted harm. The office routinely signaled their concern over emerging trends via the Bureau’s “Supervisory Highlights” report, where it issued guidance on avoiding discriminatory actions against consumers receiving public assistance incomes and reminded lenders of the obligation to “provide non-discriminatory access to credit for mortgage applicants by considering income from the Section 8 Housing Choice Voucher (HCV) Homeownership Program.” Supervisory guidance, such as this, was a critical function of OFLEO. Some might argue that the dismantling of OFLEO does not curtail the Bureau’s fair lending work. I disagree. It does. CPFB uses a risk-based prioritization process to synthesize various data to inform leadership of the riskiest institutions. This prioritization process guides the Bureau’s decisions on which banks to supervise, and for what risks. Reformulating the existing system of inputs, Director Mulvaney plans to implement a revamped risk-based prioritization system that appears to exclusively focus on the Bureau’s consumer complaints. In an email to staff, he defined his interpretation of risk: “And we will be prioritizing. In 2016, almost a third of the complaints into this office related to debt collection. Only 0.9% [of consumer complaints] related to prepaid cards and 2% to payday lending. Data like that should, and will guide our actions.” According to this rubric, payday lenders and prepaid card issuers pose the lowest risk to consumers. Exclusively relying on consumer complaints to prioritize Bureau responses is a poor idea for fair lending purposes. Detecting unfair lending practices is a tricky business, which means low consumer complaints are to be expected. Why? Because most forms of discriminatory practices are covert in the financial marketplace, and even the most sophisticated consumer is not savvy enough to identify when and how they have been discriminated against. This translates to small fair lending complaint samples. Detecting discrimination requires sophisticated statistical analyses to make informed conclusions about fair lending violations, not consumer complaints alone. Digesting the implications of OFLEO’s dismantling requires some retrospect on CFPB’s past mortgage discrimination and indirect auto lending public enforcement actions. Between 2015 and 2016 CFPB and DOJ settled two significant mortgage discrimination cases with Hudson City Savings Bank and BancorpSouth. According to the consent orders, these institutions failed to provide mortgage lending services to majority-African American and Hispanic neighborhoods. According to the BancorpSouth consent order, the bank’s lending policies afforded loan officers discretion to review applications as opposed to a centralized underwriting system and “instructed loan officers to “turn  down” minority applicants more quickly than White applicants.” When asked to defend the race-based denial policies, a manager responded: “they need to get their credit scores up” and “stop paying their damn bills late.” What was the net result? Between 2011 and 2013, more than 300 hundred qualified African American applicants were denied mortgage loans because of their race. And for the minority loans that were approved? BancorpSouth’s own statistical analyses confirmed that African American borrowers were systematically charged higher loan prices than their similarly situated white peers. In the indirect auto lending cases, CFPB and DOJ consent orders showed that indirect auto lenders allowed dealers to exercise unbounded discretion: Charging borrowers mark-up rates based on factors other than those related to their creditworthiness. In other words, a dealer’s interpersonal interaction with a borrower could influence her interest rate. Former CFPB Assistant Director Rick Hackett recounted his interactions with one dealer who gratuitously explained the discretion involved in his rate-setting process. you’ve got to understand, we’ve got a very short period of time to figure out the best way to put together all the moving parts of a complex transaction for the consumer … so we have to make quick judgments … you pick that initial rate for negotiating a finance rate, we all know Asians are better negotiators. Who was most impacted by this kind of discretion? Hispanics, African-Americans, Asians, and Pacific Islanders, according to the Bureau. Apparently, not all Asians are equivalently equipped with stellar negotiating skills. Mulvaney, in his April 11 testimony to Congress clarified that his decision to reorganize the Office of Fair Lending does not impact fair lending enforcement or supervision. His record belies this statement. Mulvaney, according to Politico, has systematically introduced “bureaucratic immobilization” through “well-placed monkey wrenches than by a change of laws.” Consider that Mr. Eric Blankenstein, a political appointee turned employee, singularly reviews and approves 100 percent of the Bureau’s enforcement activities, replacing Cordray’s panel process. These administrative changes effectively stymie all of the Bureau’s enforcement work—not just fair lending. Elections have consequences, but weakening consumer protection laws does, too. Mulvaney’s anti-protection regulation campaign will translate to unavoidable economic harm for consumers, particularly for those of color. The subprime crisis no longer grabs headlines, but a decade later, regulators continue to grapple with the metastasized fallout. This is particularly true for communities of color that were hit harder by the crisis and the aftermath. Enforcement of fair lending laws is part of the bedrock of the government’s responsibility to protect consumers from illegal, unfair, and deceptive practices. Failing to do so will harm those communities. As the subprime mortgage problem demonstrated, failing to protect any one community can threaten us all. Before joining Brookings, Makada Henry-Nickie was a senior analyst with the Consumer Financial Protection Bureau, where she advised on consumer financial protection and fair lending issues arising in financial institution regulation, enforcement matters, and rulemakings.